Click here to find an idle control valve for your vehicle. These days, pretty much every fuel injected vehicle has an electric valve that controls the engine’s idle quality and idle speed. 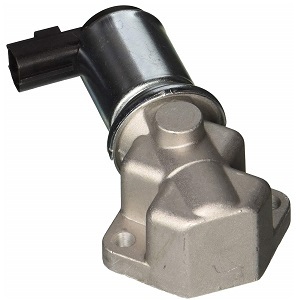 Specifically, the idle control valve (ICV), which is also sometimes called the idle air control actuator, prevents the engine from stalling and helps to maintain a steady idle rpm. The function of the idle control valve is to regulate and control the idle quality of your engine while the engine is running. Generally speaking, the idle control valve limits the amount of air entering the intake system. This is usually accomplished via actuation of the throttle body or by rerouting air via a valve to bypass the throttle body. The ECU controls the idle control valve in real time for optimal running at idle. Your engine should run smoothly and consistently at idle, but a bad idle control valve may cause the engine rpm to surge up and down (also called a hunting idle by some old school mechanics). This typically occurs due to a mechanical fault in the valve that prevents it from metering airflow properly. If the idle control valve doesn’t do its job sufficiently, it can allow the engine idle rpm to drop low enough for the engine to stall. You will typically notice this only when your foot is off the throttle such as when your vehicle approaches a stoplight or upon engine start up. A failed idle control valve can permanently allow too much or too little air into the intake during idle, resulting in an idle that is artificially high or low. A bad idle control valve may cause the Check Engine Light (CEL) to turn on. If you have an OBD scanner to check fault codes, you can verify whether the idle control valve is the cause of a check engine light. Before getting started, it’s important to know that in some cases, the idle control valve may be misbehaving because it is dirty and the valve has become stuck. Often times, cleaning the valve can help stretch out the lifespan of the component. If you’re unsure if the valve is really bad or just needs a simple cleaning, we’d suggest trying to clean the valve properly before buying a new replacement as removal and repair of the idle control valve is relatively straightforward and quick. If cleaning the idle control valve takes care of the problem, congratulations because you just saved the cost of a replacement part! If you clean the valve and it doesn’t fix the idling issues, it’s time for a replacement! Step 1 – Disconnect the negative battery cable from the battery. This can usually be done with a combination wrench or with an adjustable wrench. There is risk of electrical shock here, so use appropriate caution to avoid injury. Step 2 – Disconnect the wiring harness or harnesses connecting to the idle control valve. If the idle control valve is hidden under an engine cover, you may need to remove the engine cover prior to accessing the connectors. The harness connectors may be held with simple clips that require a small screwdriver to remove or sometimes they can be removed by hand. Step 3 – Once all harnesses are removed, you will need to remove the fasteners holding the valve to the intake manifold or throttle body. They can also be screws or fasteners, and a lot of times they are rather small and delicate. This can be accomplished with a ratchet and socket set, but be cautious to ensure that you don’t strip any fasteners or mounting holes. You may also need to remove a hose or two, which will be attached to the idle control valve via a hose clamp. You may opt to get a replacement hose clamps if the old ones are bad, but this isn’t required if your current hose clamps are in good shape. Step 4 –Grab your replacement gasket if your vehicle requires one and situate it and the new idle control valve in place. Reinstall the fasteners and reattach all other components referenced in the above steps in the reverse order that they were removed. Step 5 – Reconnect the battery cable. Start the vehicle and allow it to run for a few minutes to confirm that the idle is steady. If everything works as it should, you are ready to go for a drive! When it comes to selecting a replacement idle control valve for your vehicle, there are a number of quality brands to choose from. To help narrow your search, we have provided three brands that we recommend because we have found that they offer reliable, high value parts. Standard Motor Company offers a large array of replacement products including idle control valves. Each product is designed from the ground up with durability in mind. Each product is tested during manufacturing and also finish tested to ensure consistency. Overall, Standard makes solid idle control valves and we are confident that you will be satisfied should you decide to use one for your next ICV replacement. Click here to find a Standard idle control valve for your vehicle. Hitachi is an OEM supplier to many of the global automakers which means they understand the rigorous quality standards required to make reliable automotive parts. Hitachi is one of the world leaders in electronics, so it should be no surprise that their idle control valves are high quality. Overall, you will be in good hands if you pull the trigger on a Hitachi idle control valve so we can confidently recommend them for your next project. Click here to find a Hitachi idle control valve for your vehicle.